The menu can be a important option to get certain tasks accomplished more quickly than trying to get it done via other settings. There are many users who are writers or make much use of keyboard for typing and hate to touch the mouse every time they want to invoke a context menu. e.g. For users who use MS word, word runs the spell check and the spelling error/options are displayed in the context menu if there needs to be a correction. Going to the mouse every time to point to the word and then perform a right click is sometimes seems to be troublesome specifically if this is required multiple times. Won’t it be good if there would be just one button to invoke the menu ? This is possible and that too right there on your keyboard using the ‘Menu’ key !!! Check your keyboard if it has the “menu” key. 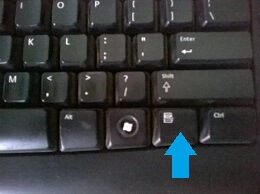 Its on the right hand side of the keyboard next to the “windows” key or between the right Ctrl and Alt key. The “Menu” key performs the same function as that of the mouse right click. Once the menu is displayed, you can toggle between the menu options using the arrow keys. However many keyboards do not have this key. In absence of this key “Shift+F10” is the next best way to simulate the mouse right click. “Shift+F10” also performs the same function and brings up the context menu.